Special occasions such as weddings, business parties and certain social functions require that you sow up with a formal hairstyle. Updo hairstyles are always acceptable in formal settings. Brushing your hair to the back or piling it neatly on top of your head, gives your neck an elongated look, and focuses attention to your shoulders. 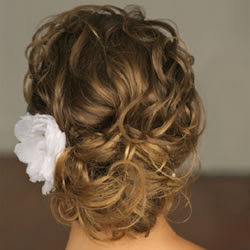 Updo hairstyles also make it possible for you to bring attention to your earrings and necklace. To sum it all up, the updo hairstyle lets you show off your beauty.